Windlesham is a village in the Surrey Heath borough of Surrey, England and civil parish that covers Bagshot and Lightwater in the same borough. Its name derives from the Windle Brook which runs south of the village into Chobham and the common suffix 'ham', the Old English word for 'homestead'. Today Windlesham has a main clustered community with various clubs. The main public parkland is linked by footpath across the M3 motorway cutting across the south of the parish, Windlesham Arboretum. Passing through its north is the A30 (London Road), two nearby train stations and Heathrow Airport make the settlement economically largely a commuter village. It has one church, St John the Baptist, the Windlesham Club and Theatre and six public houses. A few large companies of late-20th-century origin have based themselves in Windlesham, including Rainbow Play Systems and the Linde Group. A typical long line of Victorian houses close to the village centre. The Brickmakers Arms is visible. The neighbourhood has yielded bronze implements, now in the Archaeological Society's Museum, Guildford, and a certain number of neolithic flints. Windlesham was once a small community within Windsor Great Park, built as a remote farming settlement around undulating heath, similar to Sunninghill. At Ribs Down in the north in private Updown Court and adjoining gardens land reaches 99 metres above sea level with a minimum descent (notch/col) of 31 metres, ranking 35th of 36 Surrey hills listed in the national hill-climbing database and the tallest private hill in Surrey. The old road had been the source of great prosperity in Bagshot till it was superseded by the railway. Thirty coaches a day passed through, and there were many inns, since closed. The most interesting history of the place is in connexion with Windsor Forest, and its bailiwick in Surrey. The tenure of Bagshot in the Red Book of the Exchequer is per serjentiam veltrariae, i.e. providing a leash of hounds. The later history is full of the exploits of highwaymen, who found the wild country hereabouts specially favourable for their purposes. The Inclosure Act of 1812 inclosed much of Bagshot Heath, and also inclosed the common fields of Windlesham. Inclosure had begun before, for in 1768 the lords of the manors and the freeholders gave land inclosed from the waste for charitable purposes. Windlesham Manor appears among the manors granted to Westminster by Edward the Confessor in his foundation charter. It was apparently transferred to the small local Broomhall Convent at an unknown date. In 1911 the village was, due to Surrey Heath, described as almost entirely modern, in much the same way as Wentworth, Surrey's landscape was tamed approximately at the turn of the 20th century, being naturally heather, gorse and fern and ideal for grass and laid out evergreen trees. The village is known for the Lilly Research Centre, built in 1967, to the north of the village. The BOC Group was based in the village, but was bought by Linde plc (Linde AG of Germany) in September 2006. There are four schools in the Windlesham area, two of which are in the village itself: Windlesham Village Infants School. Woodcote House School is also in the area. The Field of Remembrance (WFoR) is owned, funded and run by the village community (via a board of volunteer trustees). The land was purchased from Admiral Cochrane in 1950 as a permanent memorial to the men and women of the village who lost their lives in the two World Wars. It consists of both open space and mature woodland and includes a play area. Many village events take place on the field, one of the most well known being the annual Windlesham Village Fete. The field is also used by Windlesham Football Club (Youth and Adult teams). In the summer months it is used by local cricket clubs. A Remembrance day service is hosted at the field with the Windlesham branch of the Royal British Legion. Children from Windlesham Village Infant School attend and lay a wreath, along with a member of the Royal British Legion and the Chair of the Windlesham Field of Remembrance Committee. The WFoR committee are raising funds to replace the current dilapidated pavilion building. Windlesham is known for its annual pram race in which teams race around the village stopping at every pub. This usually happens every Boxing Day. The race starts at 10:30am at the old headquarters of The BOC Group now Linde Group. The finish and prize giving is held at the Windlesham Club & Theatre. Funds raised though entry fees and coin collections on the day are distributed to local charities and good causes. Windlesham has a thriving running club, Windle Valley Runners, suitable for all standards of runner. The club meets every Tuesday, Thursday and Sunday for group training sessions and group runs, which take place in Windlesham and the surrounding areas. Windle Valley Runners compete in the winter Thames Valley Cross Country League. They also organise a monthly 10K race for members. Windlesham Drama Group is based at the Windlesham Club and Theatre. There are usually three shows a year including a pantomime (usually end of January / beginning of February) and two plays. In April 2017, the village was set to become a hedgehog friendly village, reported to be one of a handful of such villages in the United Kingdom. 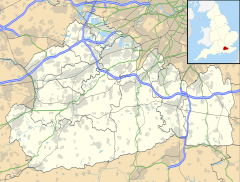 Valley End is a hamlet and chapelry in the Borough of Surrey Heath in Surrey, England 0.5 miles (0.80 km) east of Windlesham, so similarly is about 15 minutes drive from the South West Main Line at Woking to the southeast and from Sunningdale on the Waterloo to Reading Line to the north. Valley End has two churches, St Saviour which was built in 1867 by the English architect George Frederick Bodley and Emmanuel Baptist Church. St Saviour's is built in red and brown brick with stone dressed windows. The interior is a simple mixture of brick and stone. There is a Holy Communion service every Sunday at 9am. Valley End School was founded in 1859 by the Hon. Julia Bathurst of Hyams Hall, Windlesham. The Valley End Cricket Club was founded in 1895. See Bagshot for this developed part of the civil parish. There is the greatest concentration of shops and businesses in Bagshot compared to the other parts of the parish. Windlesham Arboretum is connected by footpath to the edge of the village centre but on the opposite side of the M3 motorway. In July 2007, the most expensive house in the world, Updown Court, in Windlesham was valued at £75m ($138m (USD)). This 103-room mansion has 58 acres (23 ha) of gardens and landscaped woodlands. Brian Blessed, actor, adventurer and broadcaster; current resident. HM The Queen lived in Windlesham at one time before her coronation. Andrew Ridgeley, musician of Wham! was born in the nursing home that was along Hatton Hill, Windlesham. Edward Baigent was an early emigrant to Nelson, New Zealand and he was later elected to its Parliament. HH Sheikh Mohammed bin Rashid al Maktoum, ruler of Dubai has a property at Windlesham. ^ a b c d e H.E. Malden, ed. (1911). "Parishes: Windlesham". A History of the County of Surrey: Volume 3. Institute of Historical Research. Retrieved 25 October 2012. ^ "Hedgehog Awareness Week: Brian May backs Windlesham's bid to become Surrey's first 'hedgehog-friendly' village". Surrey Live. 19 April 2017. Retrieved 17 November 2018. ^ "The village that made itself hedgehog friendly". BBC News. 22 April 2017. Retrieved 17 November 2018. ^ Conradi, Peter; Helen Davies (15 July 2007). "The most expensive house in Britain?". The Sunday Times. Retrieved 11 April 2010. ^ "60 Facts". royal.gov.uk. Archived from the original on 8 October 2015. ^ "BAIGENT, Edward". Rootsweb. Archived from the original on 6 March 2012. Retrieved 3 July 2011. ^ Wilson, James Oakley (1985) [First ed. published 1913]. New Zealand parliamentary record, 1840-1984 (4 ed.). Wellington: V.R. Ward, Govt. Printer. p. 181. OCLC 154283103. Wikimedia Commons has media related to Windlesham. This page was last edited on 2 December 2018, at 07:26 (UTC).